Flying cars and a robot petting zoo. Mobile wallets and net neutrality. The most outlandish ideas of the future and tech trends shaping the world today will be in focus as the freewheeling South by Southwest Interactive Festival kicks off Friday. The annual Austin, Texas gathering has a looser reputation than bigger tech conferences like the Consumer Electronics Show in Las Vegas and the Mobile World Congress in Barcelona, even as it has become more corporate in recent years. It's a place where a Grumpy Cat appearance can generate as much excitement as the latest tech gizmo. It brought Twitter prominence in 2007 and location-sharing app Foursquare in 2009, but has since moved beyond the latest "killer app." Last year, cyber security took center stage as NSA leaker Edward Snowden and WikiLeaks founder Julian Assange headlined the lineup of panels and speakers. UpdatedEdward Snowden to SXSW Techies: Be the "Firefighters"
This year top speakers will tackle how to bring ideas that might seem like science fiction to the real world. Google's Astro Teller, who heads the tech giant's X division, will discuss making some of Google's most ambitious projects, like self-driving cars or balloon-powered Internet, a reality. United Therapeutics CEO Martine Rothblatt will talk about tech innovations intersecting with artificial intelligence, immorality and the future of self. The Winklevoss twins, Tyler and Cameron, will be on hand to discuss what Bitcoin needs to do to succeed as a mainstream currency. And former vice president Al Gore will make his third appearance at the annual festival to plug for new global climate legislation that is up for a vote in December. But aside from the big-name keynotes, festival director Hugh Forrest says the heart of the conference is the smaller panels and competitions. UpdatedPolice Describe SXSW Crash as "Intentional Act"
"We're excited about the very strong speakers we have, but the heart of the event is really the up-and -coming people we haven't heard of yet, people we'll hear of in the next few years," Forrest says. "South by Southwest is always about up-and-coming talent, be it a band or filmmaker or technology developer, and that holds true in 2015." About 33,000-plus attendees from 82 countries are expected to flood into Austin to attend panels, network and party. Jack Krawczyk, director of product management for music streaming site Pandora, said the festival is an ideal place to connect with Pandora clients and others in the tech sphere, particularly because of its focus on both music and technology. 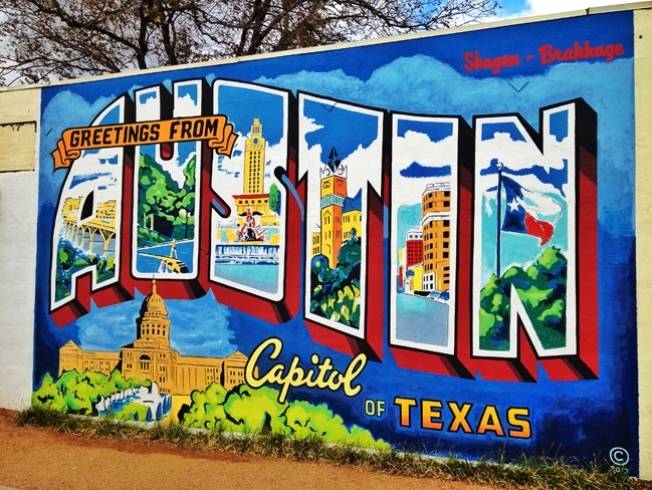 The company has had a presence at SXSW since it launched in 2005 and hosts a "Discovery Den" with performances by 35 artists during the festival. "It's a great place to get a lot of like-minded folks in the industry together to think about how interactive media is evolving and shifting," Krawczyk says. Here are a few trends to watch. Actress Jessica Alba on Monday will discuss how she has grown The Honest Co., which makes and sells environmentally friendly household and baby products online, into a $1 billion company. Actor Russell Brand, whose documentary "Brand: A Second Coming" opens the film section of SXSW, will talk Tuesday about his new daily YouTube show Trews and the power of online media. Also Tuesday, retired news anchor Dan Rather address breaking news in the era of Snapchat. The nonprofit Field Innovation Team is hosting a "Robot Petting Zoo" Sunday through Tuesday to showcase new robots that have helped or are being developed to aid in disaster and humanitarian crisis spots, such as a drone that can 3D print in midair. Attendees will be able to interact with the robots and learn about what they do. Meanwhile, government agency USAID is debuting a prototype of a new Ebola-fighting suit for healthcare workers that is faster and more efficient than the current suit. The Internet of things will be a hot topic as well. The Connected Car Council is hosting a pavilion on Saturday where automakers including Ford, Chrysler and Hyundai will showcase new technology. And Slovakian company Aeromobil, will detail its mission to create a flying car. The film festival at SXSW has several tech-related movies debuting, including Alex Gibney's documentary "Steve Jobs: The Man in the Machine" which examines the Apple co-founder's legacy, and the documentary "Deep Web," which chronicles the arrest of Ross William Ulbricht, the founder of online black market Silk Road. With limited public transportation and spread out hotels and venues, pedicabs have often been the easiest way to get around in prior years. Ride-hailing companies hope to change that. The festival's official ride-hailing company is Lyft, which will have designated pickup and drop-off zones around Austin's convention center. Lyft will also be offering Lyft Line, its carpooling service, in Austin. But it will have competition. Uber will be offering its uberPool car-sharing service in the city as well, plus a promotion where some drivers may have VIP tickets to some SXSW events.